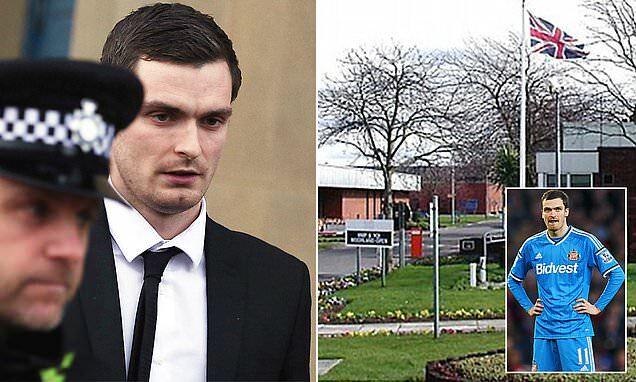 Disgraced former England footballer Adam Johnson is set to leave prison by Friday, just halfway through his six-year sentence. A source close to his family claims that Johnson, 31, will leave Moorlands Prison in Doncaster, South Yorkshire in the middle of the night 'under the cover of darkness to protect him from vigilantes'. Johnson was sentenced to six years' imprisonment in 2016 for grooming and sexual activity with a 15-year-old. However, the former Manchester City and Sunderland footballer is set to be released on parole in March. Johnson is reported to have received his final jail visit this week from his family, including his daughter Ayla, four. The source told the Sun: 'Adam is terrified about coming out of prison. He's worried about the backlash from nutters or vigilantes who might go for him. 'His family went to see him to reassure him they will be there waiting for him. It's because he is so scared officials made the decision about his release.